I know it's not a pet portrait, or is it? My wife digs the Sasquatch & we watch "Finding Bigfoot" on Animal Planet every week. 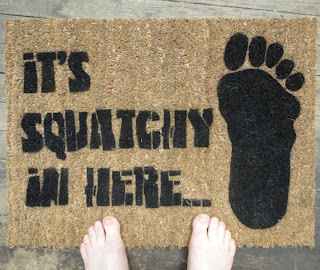 So she designed this Bigfoot doormat! I love it when the BFRO (Bigfoot Field Researchers Organization) drives through a wooded area and says "It's Squatchy in here...." spooky! That Bigfoot print is to scale- check out my wife's size 11 feet next to that! It's up now at my etsy store, Damn Good Doormats.